Over the years I have asked groups of Christian adults how many of them grew up in homes where there was regular family worship. Early on it was rare to find people (typically of my generation or older) who answered affirmatively. In recent years the number of positive responses has increased dramatically—almost exclusively with younger generations of believers. This is a hopeful and encouraging indication of biblical reformation taking place. Regular family worship is valuable and brings many blessings to parents and children alike. Here are five benefits that I have observed. Family worship is a great way for parents to evangelize and disciple their children. God places this responsibility squarely on the shoulders of parents when Scripture instructs us to bring children up “in the discipline and instruction of the Lord” (Ephesians 6:4). Yes, this means that parents should see to it that their children are consistently integrated into the life of a biblically healthy church and regularly under the preaching and teaching of God’s Word in that church. But it also means that parents are to be directly engaged in teaching their children the truth about God from Scripture. As Moses instructed the Israelites, “And these words that I command you today shall be on your heart. You shall teach them diligently to your children, and shall talk of them when you sit in your house, and when you walk by the way, and when you lie down, and when you rise” (Deuteronomy 6:6-7). Parents are responsible for spiritually training their children and regular family worship tremendously aids in that effort. Children can learn to worship corporately with other believers by consistently worshiping the Lord in their homes. This does not mean that family worship will have the same formality of church worship but it does mean parents can show children the importance of being attentive and reverent when God’s Word is being read, when praise is being offered to Him in song and when He is being addressed in prayer. Reverence and attentiveness are learned traits and wise parents know that their children will not naturally acquire them. It is much easier to teach children how and why to be reverent in the Lord’s Day gatherings of the church if those same lessons are being reinforced in the familiar surroundings of the home throughout the week. As a pastor I am always encouraged when I see parents taking this responsibility seriously because I know that their children are being taught to worship the living God. Regular family worship provides parents natural opportunities to encourage their children to talk about their inner spiritual lives. “What does this Scripture mean for us today?” “How should we respond to what God says?” “Do you really believe this?” Such questions can be thoughtfully and disarmingly asked at such times. Parents can model how to respond to God’s Word by offering their own honest answers. As children see their parents depending on God’s grace, humbly confessing sin and hopefully trusting in Christ, they will be encouraged to express their own inner thoughts, fears, hopes and desires. They will also learn how to ask for prayer and to pray for others. Regular family worship provides an opportunity to testify to the truth and power of the gospel to guests in your home. When showing hospitality neighbors, friends or family, the regular rhythms of family worship should not be abandoned. If it is an established pattern in your home, then it will be natural to engage in it even with guests present. This should be handled wisely and humbly so as not to come across in a self-righteous or condemning way. A simple question can often suffice to avoid this. “We normally take a few minutes at this time to read the Bible, sing and pray as a family. Would you mind if we do that together?” When families regularly worship God in the home and regularly practice hospitality, this opportunity will regularly present itself. These are five benefits of family worship that I have seen and experienced over the years. What others would you add to the list? Tom has served as a Pastor of Grace Baptist Church since 1986. Prior to moving to Florida he served as pastor and associate pastor of churches in Texas. 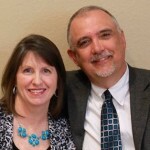 He has a BS degree in sociology from Texas A&M University (1979) and has also earned the MDiv and PhD degrees from Southwestern Baptist Theological Seminary in Ft. Worth, Texas. His major field of study was Baptist Theology. He has served as an adjunct professor of theology for New Orleans Baptist Theological Seminary, Reformed Theological Seminary, the Midwest Center for Theological Studies and Reformed Baptist Seminary. He is a Visiting Professor at the Nicole Institute for Baptist Studies at Reformed Theological Seminary in Orlando, Florida and adjunct professor for Southeastern Baptist Theological Seminary through their Southwest Florida Equip Center. Tom serves as the Executive Director of Founders Ministries, an organization committed to reformation and revival in local churches. He edits the Founders Journal, a quarterly theological publication of Founders Ministries, and has written hundreds of articles for various journals and magazines. He has been a regular contributor to TableTalk, the monthly magazine of Ligonier Ministries. He has also edited and contributed to several books in addition to authoring From the Protestant Reformation to the Southern Baptist Convention and Traditional Theology and the SBC. Tom regularly preaches and lectures at various conferences throughout the United States and other countries. In addition to contributing to the Founders Blog he also blogs at tomascol.com. Tom coaches a girls High School basketball team that is comprised of homeschooled students. He also enjoys hunting and riding motorcycles, and, though he currently is "in between bikes," lives with the hope that one day he will have his own Harley. He and Donna have ten children, including 3 sons-in-law and a daughter-in-law. They also have one granddaughter who has preceded them into the land of the living, and another one along with 4 grandsons who absolutely rock. Thank you for the helpful reminder, Dr. Ascol. All of your points resonated with me as a follower of Christ and father of three children. Consonant with what you have shared, my wife and I have found that family worship provides a unique opportunity for our children to openly express biblical and spiritual questions, concerns, and observations. I am hopeful that these moments gathered around the word of God in prayer and song are enjoining my children as participants rather than as spectators in the worship of our gracious and powerful triune God. Blessings to you, your family, and our brothers and sisters at Grace Baptist Church. Thank you, I was blessed and encouraged! In our family, evenings were more hectic than mornings, so we moved family worship to breakfast time. It was a blessing to start the day reading a passage from the Bible or a good book together. The children took turns writing prayer requests in a notebook. What a benefit it was to see the check marks in the notebook and show our children how God was answering our prayers! I am the father of six children. The concept of family worship was introduced to me about 7 years ago and it has been a life changing experience for all of us. My children love it , they are learning so much and their relationship with God seems to be so much stronger. And it surprises me because our family worship is so simple and we haven’t been as consistent as I would have liked to.